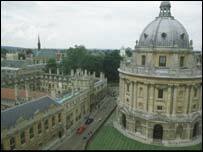 Two students from Oxford University are facing disciplinary action after hacking into the university's computer. They could be fined £500 or be suspended after infiltrating the system and publishing their story in a student newspaper. First-year students Patrick Foster and Roger Waite say they wanted to expose the weakness in the IT system. They were able to view live closed circuit material and access information about students' computer use. They published their story in the student newspaper Oxford Student. Mr Foster, a former deputy editor of the paper, said it took only minutes to access sensitive information. "We had a look using a program that is easily available over Google," he said. "We were able to infiltrate the IT network to the extent that, in one college, we could view live CCTV scenes. "Roger had up on his screen the live CCTV footage and at any point he could have shut it down." They were also able to access fellow students' email passwords and see which webpages they were viewing, he said. The students are now facing several investigations by the police and university bodies. A spokeswoman for the university said: "Anyone found to have breached university regulations on computer use would be referred to the proctors and would be subject to investigation. "Anyone committing a criminal offence would be referred to Thames Valley Police. "The university knows that the vast majority of students greatly appreciate their free access to excellent computing facilities and would not abuse that access." The students say they are being treated very harshly for something they did "with good intent". They have been brought before the university proctors, who deal with student discipline, and say they made a full confession there. Next they will go before the university's Court of Summary Jurisdiction, where they could be fined and suspended from the university (known as rustication). The hearing is expected in September. Mr Foster said: "Roger and I are obviously very worried that what we have done could jeopardise our degrees but we're happy to face up to it, however unfair we may think it is".